The grenade was discovered in the vicinity of a private residence on the Pennywell Road. A NUMBER OF houses were evacuated during the night after a grenade was discovered in the Pennywell Road area of Limerick. 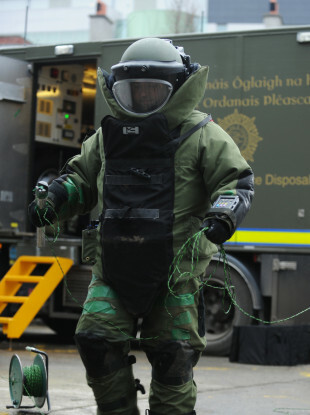 Following a request from An Garda Síochána, an Army Bomb Disposal Team conducted a controlled explosion on the grenade which failed to detonate. The grenade was discovered in the vicinity of a private residence at Cathedral Court, Pennywell at around 10.25pm. The Army Bomb Disposal Team arrived on scene at 1.30am. A number of houses were evacuated and the area was cordoned off during the explosion, in the interest of public safety. The scene was declared safe at 3.18am. No one was injured during the operation. Gardaí in Henry Street have launched an investigation into the discovery of the device. The Defence Forces advise any members of the public who encounter such devices to maintain a safe distance and inform An Garda Síochána immediately. Email “Limerick homes evacuated as Army Bomb Disposal Team explode grenade found in the area”. Feedback on “Limerick homes evacuated as Army Bomb Disposal Team explode grenade found in the area”.